Leading scholars in the field of social networks from diverse disciplines present the first systematic and comprehensive collection of current theories and empirical research on the informal connections that individuals have for support, help, and information from other people. Expanding on concepts originally formulated by Pierre Bourdieu and James Coleman, this seminal work will find an essential place with educators and students in the fields of social networks, rational choice theory, institutions, and the socioeconomics of poverty, labor markets, social psychology, and race. The volume is divided into three parts. The first segment clarifies social capital as a concept and explores its theoretical and operational bases. 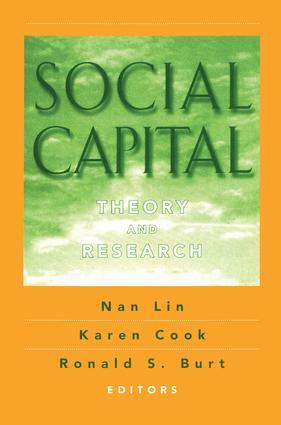 Additional segments provide brief accounts that place the development of social capital in the context of the family of capital theorists, and identify some critical but controversial perspectives and statements regarding social capital in the literature. The editors then make the argument for the network perspective, why and how such a perspective can clarify controversies and advance our understanding of a whole range of instrumental and expressive outcomes.